We have acquired a great new product - glide-along mobile steps with handrails. These mobile steps are fantastic for use at home, in the workplace or in the warehouse. They come in a great selection of colours and heights ranging from 2 tread to 5 tread. We thought it would be a tragedy not to show them off in our step by step guide to Steps. You’ll be sorry if you don’t read it. Step one - we introduce the 2 ribbed-rubber tread glide-along mobile steps with handrails. They’re really easy to manoeuvre and turn around. You can replace your wobbly old kick-stool with this much safer version with handrail. Perfect for those of us a little unsteady on our feet. No need to stomp around looking for something to stand on to reach the top shelf, grab a set of 3 tread glide-along mobile steps with handrails right here and now. The swivel casters are surrounded by a cup with a protective rubber trim which means they’re safe to keep movin’ on all floor surfaces. If you’re looking to reach that bit further, there are always the 4 tread steps with a top platform height of 1016mm. Words are not enough to describe how useful these steps are. Create a real buzz with the tallest version of these steps. These are a sky-scraping 1270mm high - with their help you’ll reach the top of the charts in a heartbeat. They have 5 rubber treads, one each for Lisa, Claire, Faye, Lee and H! All heights of mobile glide-along steps are available in red, green, yellow and a deeper shade of blue. Once you’ve stepped onto them you’ll simply be too weak to resist. So, it’s time to banish those rickety old wooden step ladders, they are definitely better best forgotten. 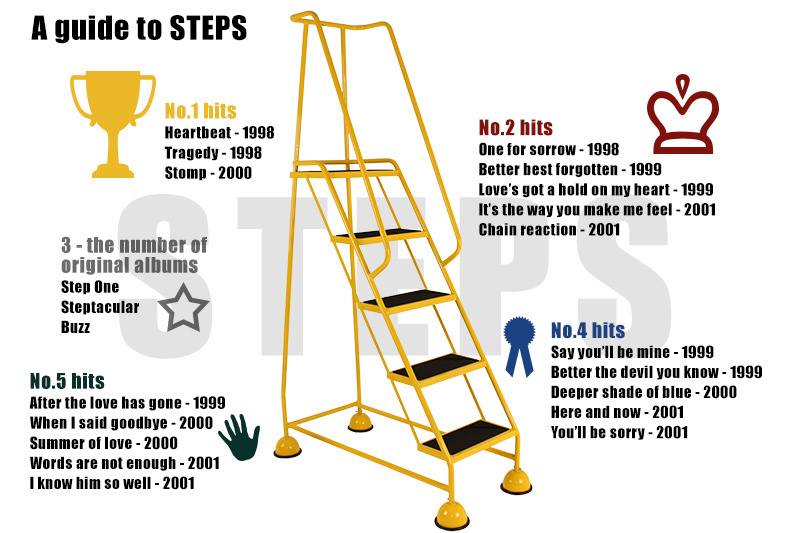 We hope you enjoyed our Steptacular guide to steps. Let us know how many cheeky reference's to 90's and 00's pop sensation STEPS you can spot!